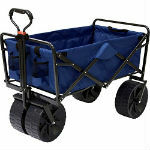 Portable folding utility wagons and beach wagons are great for hauling beach toys and accessories, lawn and garden materials, sports equipment and camping gear. Mac Sports folding utility wagons and heavy duty collapsible beach wagons are the best portable wagons you can buy. They out maneuver and out haul the competition, like Ozark Trail folding wagons. Mac Sports portable folding wagons make great kids wagons. 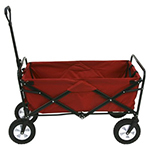 Many parents prefer them over Radio Flyer wagons and kids canopy wagons. 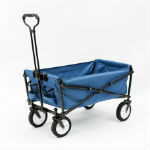 The accordion style design provides durable strength and allows you to fold, store and transport your wagon with ease. Our folding wagons are fully collapsible, yet are strong enough to support up to 150lbs. The wagons are manufactured for durability and years of reliable use. Top rated 5 star customer reviews praise the extra large oversized wheels on the Mac Sports folding beach wagon which can traverse sand, snow, dirt and almost any terrain. The large rubber wheels on the Mac Sports portable utility wagon are ideal for pulling the kids sporting equipment, hauling yard and garden materials or bringing in those heavy groceries. All of our folding wagons come with a 1-year manufacturer warranty, giving you peace of mind in your decision to buy the Mac Sports folding utility wagon and beach wagon.